On our trip from Italy to UK, we decided to detour. In honesty, it probably wasn't a detour- we didn't have a route planned in the first place!! Still, we looked at the map and decided to take our motorhome through the Alps. Which all sounds good and well until you realise it's March. Which means snow. We love planning a route as we go– but we hadn't really appreciated the climate change between sunny south coast Menton (where we were in T-shirts!) to up a mountain… in the snow. Motorhome Touring in the French Alps- watch the video! Motorhome Touring in France- do I need snowchains? Motorhome Touring in Italy- do I need snowchains? From Genoa, we headed north to Alessandria, then west past Turin on the A21 which becomes the A55 and goes into the A43 on the French side. 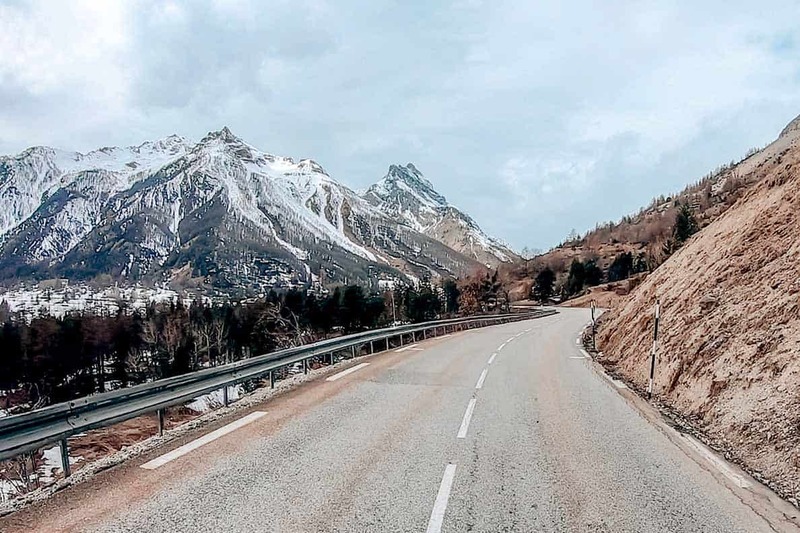 If you don't want to do ‘proper' mountain roads, this is a great alternative as this road goes through the Alps but is a dual-carriageway (with the tolls to match!) I believe this road will be open in all but the very worst weather, so it's a good route to get from France to Italy all year. Because we didn't know what to expect in terms of weather and snow, we stuck to the main roads until we got into the mountains so that we could see exactly what the conditions were like. Apparently, it wasn't a good season for snow, and many places were more accessible than usual, so each year will be different. Pay close attention to Google Maps if you use that to plan a route- if you zoom in close enough it will show you which roads are blocked off. We drove until it started to get dark- then we looked for a suitable place to stop. Sadly, many of the wild camping places were on roads which were still closed off and we didn't want to deal with any crazy mountain roads in the dark, so we decided on an aire quite close to the main road in Cesana, right on the French/ Italian border. Part of the 2006 Winter Olympics were held here and there are Olympic rings everywhere. There are also Christmas decorations still up in March- I have no idea if they're up all year or not, but they looked very pretty! Cesana is a beautiful village with lots of wooden chalets and posh shops as you would expect in a ski resort. We didn't see an ACTUAL ‘sells everything' shop, like a CO-OP, but there were many exclusive wine, meat and cheese stores. There were also several restaurants, which smelt amazing, but we didn't sample any. Not sure our budget would have handled it!! The aire cost 12€ and you pay at the hotel next door. The entrance to the aire is VERY narrow- we almost didn't try it in our motorhome with the trailer, but we did fit, so if we can do it you probably can too! Electric hookup is included in the price and all waste facilities are there except toilet- although that may have been hiding around the back. Overall, it was a beautiful aire and we highly recommend it- just look at the video to see the views! Having seen how little snow there was around, we decided to head over the mountains instead of going back on the boring main road. We were surprised and pleased by how clear the roads were- even with thick snow piled up on the sides. They do a good job of clearing the main routes. It was a really easy road- sure, there were some steep climbs/ descents and many, many hairpin bends at times, but the scenery was BREATHTAKING! Did you really think we'd go through all that beauty and not make a video??!! We show you the Aire we stayed in (although technically it was a Sosta as we were still in Italy!) You can also see the incredible views and the route that we took through the mountains, as well as the puppy's first experience of proper snow- which frankly was hilarious!! We passed several villages and towns which were ski resorts- sadly, neither of us ski and we're both slightly convinced that we will die if we try it, but there were many places where you could park up the motorhome for a few weeks and go skiing if you want. If that's something that interests you, you'll find more advice here. Snowchains are compulsory in several countries across Europe, including France. Local signs will tell you when they must be fitted. Look for ‘Aire de Chainage' – this is where snowchains can be fitted/ removed. We carry snowchains- luckily we've never had to fit them! Winter tyres are not compulsory but are recommended between October and April. Again, snowchains are compulsory in the Italian Alps and winter tyres are recommended between October and mid-April. Next stop- Lake Annecy – where we discovered what NOT to do!!! Have you been in the Alps with a Motorhome? Did you enjoy it?